In today’s Webmaster Office Hours, John Mueller was answering a question related to the frequency of Google updating ranking signals for pages in the search results. But one thing that was interesting was he confirmed that the history of a page or site plays a role in how some search algos rank it, something that would probably go unnoticed by most that watched the Office Hours. And the various algorithms that we have, they do try to be fast and responding to what’s out there on the web, but some of them are fast, some of them are a bit slower, and some of them like to take into account more of the history of what has been changing there. 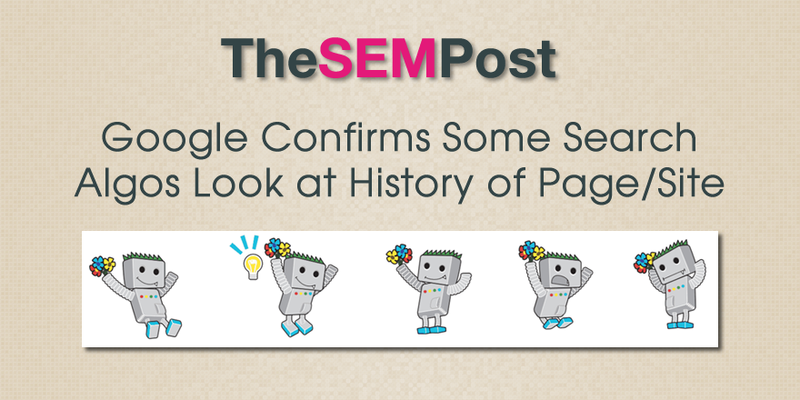 Now SEOs have long speculated that historical changes can have an impact. While the most obvious one would be changes made to content, Google has also said that sites can see Panda recovery very quickly after improving the quality on individual pages. Another possibility is redirect related, but again, these are issues that can be solved fairly quickly when redirects are changed or removed. So the question remains of what other historical signals could be taken into account. Link (on site or off site) related? Schema related? Some specific content related signals? Or about 190 other possible signals it could be. And Mueller does specifically say “some” implying there are multiple signals that take history into account. We do know that historical changes can have an impact with manual actions. For instance, Google has confirmed if they see a site repeatedly disavowing links, filing a reconsideration request for a link spam manual action, then removing the disavow after the manual action is removed, that Google will treat that site more harshly in the future. The same applies to legacy manual actions, that are still attached to a site from a previous domain owner’s spammy SEO. But those are all manual actions, not algorithmic. I am sure SEOs will be mulling over this. Here is the video queued to the revelant quote. For the full context see this article.